Leonard and Tricia Colpitts died on November 14th. Leonard was 57 and Tricia was 53. They are survived by 4 children and one grandchild; Kenneth 28, Joann 27, Lynn 24, Jake 23 and his wife Stephanie 23, and their son Dylan, 1. Leonard was born in Malta, Montana and joined the army at 17. He has two masters degrees and continued his education until his death. He enjoyed hunting, fishing, and archery. Tricia was born in Salt Lake CityUT and met Leonard in Rock Springs Wyoming the day Leonard got out of the Army. She followed him to the University of Wyoming and they were married May 27, 1976 in Green River Wyoming. 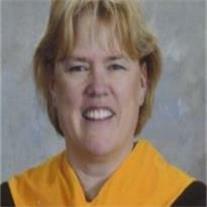 Tricia graduated nursing school in 1979 and obtained her doctorate of nursing practice in 2008. They were devoted parents and grandparents and still very much in love when they died. They are loved and will be dearly missed. Services will be held at St. Bridget’s Catholic Church, 2213 N. Lindsey Rd. Mesa, AZ 85213. There will be a vigil Friday the 19th at 7pm and a funeral mass Saturday the 20th at 10 am.